"A great feeling of pride can be engendered amongst the people of a city if they can see a reflection of their history and cultural environment in the physical fabric of the city." - Grahame Hall, Rotorua Mayor, Jan 2003. The Rotorua District Council is proposing to introduce 'Rotorua City Design Principles' to guide appropriate development within the CBD. This includes guidance on aspects such as the building façade and verandahs, as well as a colour palette. The important consideration is to ensure that new development is of quality, and that it fits within the established streetscape. The use of colour on buildings in the city has a significant impact on the streetscape. Rotorua is a natural wonderland of geothermal activity, New Zealand native bush and beautiful lakes. This natural beauty is underpinned by a strong Maori heritage and sense of pride in this unique place. The Rotorua colour palette has been developed to reflect those important influences on Rotorua. It focuses on bush and heritage greens, earthy browns, greys and terracottas, bright reds associated with Maori tradition through to the deeper maroons associated with heritage schemes. Pinks and purples are noticeably absent from the palette as it is believed that these are not part of the true Rotorua identity. Use colours from the Rotorua Palette. All colours are drawn from the Resene Total Colour System, available at Resene ColorShops. 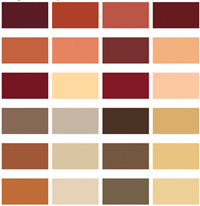 A4 samples of all Rotorua Palette colours are available for viewing at the Resene ColorShop in Rotorua. 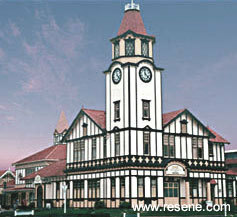 Click here to view the Rotorua Colour Palette.